Creepy Tennessee creature story about a Halloween hike that might make you think twice about walking the woods alone! Written by Robert Godwin. Buster was riding shotgun in my old rusty pick-up as we drove up the winding mountain road. Even though the window on his side was open to the cool October air, he didn’t stick his head out like most dogs would. I reached out and patted him. A serious, reserved husky—something mix, he just glanced over to acknowledge the contact. “Great weekend for hiking, eh, Buster?” Another silent glance brought a chuckle from me. I live in the country in East Tennessee, far enough to be away from people, close enough to use the library, enjoy the symphony, or get to the hospital if I need to. I live pretty “green,” drawing water from my spring and heating my small log house with wood cut on my own land. I have electrical service, but I’m at the end of the line and lose power so often I got some solar panels and a generator. The Co-op long ago learned to dread my appearance, bill in hand, demanding a pro rata adjustment of their basic charge supported by the time my clock stopped to the time power was restored. Now when I appear, they just ask, “How long were you out?” and make the adjustment. He didn’t answer, but just sat there watching me. He looked to be about eighty pounds with an intelligent face, thick grayish-brown fur, and no collar. There were a good number of scars on his coat, he looked healthy and strong, but kind of underfed. I went back inside and retrieved some leftovers from last night’s supper and set them in a bowl a few feet outside the door. The dog didn’t move. I carried the bowl a little farther out and retreated to my chair beside the front door. We looked at each other. Finally he stood up, walked deliberately to the bowl and ate, ignoring me completely. When he was finished, he got a drink from my spring, walked back toward me and laid down about six feet away facing the same direction as me. After listening to some doves cooing for a while, and watching a chipmunk brave enough to scurry around the corner of the house, I turned to him and said, “Well, if you’re going to stay around, you’ll need a name. How about ‘Buster’?” He never looked at me, but gave a wag which I took for assent. Several months later, I thought it would be wise to get him vaccinated and started to put a collar and leash on him. It’s the only time he ever growled at me. As big as he was, with those teeth and that attitude, I decided he didn’t need a trip to the vet after all. So you see, he’s really not my dog. We’re friends, but he’s his own man. He goes off for a couple of days occasionally and returns when he’s ready and accepts my fond greeting with reserved appreciation. It’s been that way for about three years now. He rarely comes inside regardless of the weather. He’ll sleep under the eaves if it’s raining heavily, but snow is a welcome treat, and he simply curls up with his bushy tail covering his face. I often leave my door open in good weather, and one time while I was seated at the kitchen table he walked in, toured every room, and went back out and lay down on the porch, satisfied that he’d seen my house. I always hiked alone before Buster. I was a city boy, but grew up loving the mountains. I went on my first real hike when I was four. My father and mother’s brother and father took me up the Chimneys above Gatlinburg in the mid-1940s. 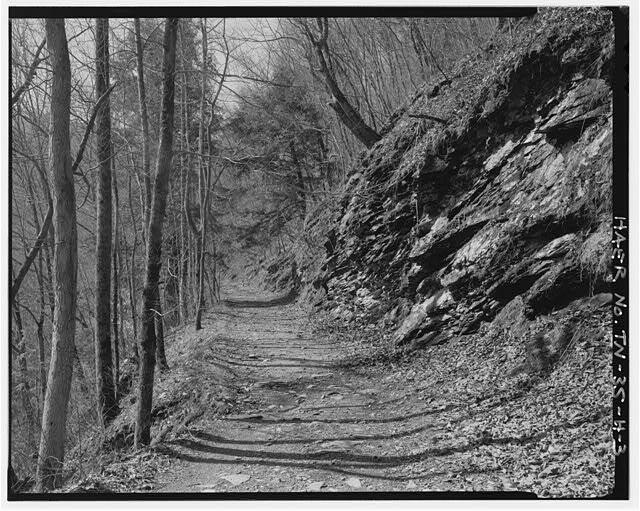 It was only about ten years after the Great Smoky Mountains National Park was established and the trail was pretty rugged, particularly toward the top where you had to scale a rock face with only roots for handholds. As an adult, I went hiking to get away from people, not to socialize with them. Most people disrespect Mother Nature or are so insensitive to her charms that they take iPods and cell phones on the trail. Nothing except the trash they leave aggravates me more than having nature’s sounds interrupted by, “Where are you?” “Watcha doin’?” I’m not antisocial, I just prefer a better class of company. Fortunately, such people rarely travel more than a mile into the woods. At the back of his farm were some old trails leading into the forest which haven’t been maintained since CCC days in the late 30’s and 40’s. A lot of places have disappeared due to windfalls, washouts, or just being overgrown—my kind of territory. As we came to his place, I stopped at his mailbox, got his mail, and turned up his gravel drive. I pulled all the way under a brilliant yellow and red maple beside his back porch. His dogs barked my arrival. Buster didn’t wait for me to open his door, but pushed by to jump out my side as soon as I opened the door. After their ritual greetings, all three dogs trotted off toward the barn. The rear screen door slammed shut behind Whaley. I never knew him by any other name. Tall, rangy, always in bib overalls and long-sleeve shirt and high-top brown work shoes, he reminded me of the mountain folk my grandfather introduced me to as a child. My mother’s father was a small, dignified city man, seemingly quite unlike the mountain folk. Their meetings were always the same: a greeting, a handshake, a few words about the weather and the family, and only then would they get down to the business of the day. It wasn’t hurried, it wasn’t unduly prolonged, it was a ritual born of mutual respect and courtesy, and often affection. Whaley still lived in that time. He “howdied” me and the dog, Buster acknowledging his greeting with a single wag between sniffing the west side of the barn and the back of the pump house. “Sure would like to have that dog,” he said, as he had many times before. “You’ll have to deal with him on that,” I replied, as I had an equal number of times. I thanked him, not sure if he was joshing me, got my pack from the bed of the truck, waved goodbye and headed for the north side of his farm following the tractor path on the edge of his field. Buster joined me about a quarter mile up the way. As we approached the forest edge, I was startled by a raven’s hoarse cry. I stopped and located him not twenty feet away on a dead limb barely above my head. He was staring at me. I couldn’t resist: “Been reading Poe, have you?” He ducked his head twice as though acknowledging it and continued to stare at me. As I continued along the path, he croaked again, flew a few trees further and did it again. Strange, I thought. So close. The watchdog of the forest warning me rather than the other creatures. Even Buster took note. The rain Whaley mentioned had left the ground soft and had cleared the fall air. The late afternoon sun angled through the trees alternating patches of brilliant reds and yellows with shafts of dark shadows. The trail was clear enough here, a wonderful aisle of fallen leaves. As we walked, it led to a windfall. Working around the tree, we found the trail a few yards beyond and followed it until it disappeared into a grove of pine saplings. To this point, I had seen footprints of hiking boots here and there, the distinctive Vibram pattern, just what I would have expected of college kids. Working my way around the pine grove, I spotted the prints again. OK, going the same way as me—they weren’t too bad in the woods. We came on a fallen chestnut tree gradually turning to rich red soil, victim of the blight seventy years ago. I could see fresh damage where someone had stepped on it. A little further on as the trail began to rise, tree roots made little terrace stair steps. The late afternoon air had the tang of fallen leaves and evergreens. We pushed through a rhododendron thicket, the trail reduced to an animal path. Eventually, we came to the open area I had intended to camp in. Not surprisingly, I saw the tent peg holes and the charred remains of the kids’ campfire, again exactly where I would have put mine. The sun was low now and the shadows long and deep, as I strung my tarp on some trees at the edge of the clearing and collected firewood. Late October was warm in the sun, cool in the shadows, and cold overnight. I gathered a good-sized pile of wood. I got a fire going, boiled some water and poured it into my dehydrated food pack. I had enough water left to make some tea. By the time the tea had brewed, my beef stroganoff was ready to eat. When I had finished and fed Buster, shadows had engulfed the glade. It was a quiet peaceful time, neither day nor night, rapidly sinking into darkness. I lay on the thick grass beside the fire on one side, Buster on the other, his head between his paws. As the temperature dropped, I fed the fire, stirring the coals and sending sparks skyward. I had collected enough wood for the evening fire and would bank it when I was ready to crawl into my sleeping bag with plenty enough left for the morning. The fire was fragrant and popped and crackled pleasantly. I must have dozed off, but came wide awake when Buster’s head snapped up, gaze fixed on the wood line twenty-five yards away. I followed his eyes, but could see nothing beyond the small reach of our dying fire. The new moon gave little light, hardly obscuring the stars nearest it. I strained against the darkness while Buster rose to his feet, low growl hardly audible. He took a stiff-legged step, mane now raised, fangs glistening in the firelight, and growl rumbling through the night. Adrenaline shot through me. Buster didn’t give false alarms. I had no weapon. I went into the woods believing I was not natural prey of anything except chiggers and mosquitoes. I’d encountered bears, snakes, boar, elk, moose, and bison in my travels. When that happened, I acted as if I was an uninvited guest in their living room, and always had escaped harm. This was different. Something was invading my space. Without taking my eyes off the blackness, I stirred the fire, put on more wood, then paused, every sense straining to learn what was there. Buster’s growl grew as he took another step toward the forest edge. I grabbed a stick burning on one end and stood, waving it back and forth before me for protection and light. My flashlight was a few feet away at my sleeping bag, and I debated whether to get it. Just then, there was a noise from the blackness and Buster responded with ferocious snarls and growls, and bounded half a step. I could see nothing but blackness ahead of us. It wasn’t the chill that gave me the shivers. In spite of myself, Whaley’s comment about his dogs getting riled, “haints,” and the raven’s warning flooded my mind. I vainly tried to dismiss them. They would be just summer camp ghost stories around the fire, except for Buster’s reaction. I shivered again and zipped up my jacket. My stick was going out, and I returned it to the fire grabbing another one which was burning brightly. There was nothing to be seen. Buster’s growls had subsided, but his hackles were still raised, and he was stiffly at attention. His ears twitched as we both heard a distant twig snap. I held my breath and strained as hard as I could, but heard no other sound. We stood like statues. Finally, I stepped back to the fire, and heaped more wood on it until it blazed high. Buster slowly trotted toward the forest, sniffing the air, then sniffing the ground. Even with the fire going briskly, he was hard to see at the edge of the glade. I called to him, and he came back, no longer alarmed, but still on the alert. I realized my pulse was pounding, and I had broken a sweat, despite the chilled air. Even though it was only a few feet away, I carried a lighted stick to my pack, hunting for my flashlight. I had strung my tarp between some small trees near the edge of the forest, some distance from the fire. It no longer seemed like a good place. I repositioned my ground cloth beside the fire, moved my gear to it, and spread the tarp over it all. Armed with my flashlight and a burning stick, I reconnoitered the glade’s perimeter with Buster at my side. Nothing. He showed little interest except where the initial alarm had occurred. He stood sniffing intently. I caught a whiff of animal musk, but couldn’t identify it. As we returned to the fire, I looked at my watch. It was barely eleven o’clock, hardly the bewitching hour I chided myself. We made our way back to the fire. “Didn’t seem like a bear, Buster—too big for a possum or raccoon—boar don’t roam around at night. What do you reckon it was?” It never bothered me talking to animals. They talked enough to me to make it a good conversation. Buster twitched an ear at the question and lay back down. Good enough for me. Danger, if any, had passed. Still, I put on more wood before I crawled into my bag, pack at my head. There would be a bit of frost tonight. I awoke to the echoes of an inhuman scream. The fire was only a faint glow within its ring of rocks, and the moon was little help. I could sense Buster was standing at attention. Pulse pounding, I slipped out of my bag and grabbed two sticks. I stirred the fire with one and piled on some twigs and leaves. I held the other as a club. As the leaves caught fire, I thought I saw movement at the edge of the woods, but their flare was so brief, I couldn’t tell. Buster was growling low and steady. The sliver of the moon had moved behind leafless treetops which it barely outlined. I guessed it was less than an hour since I had bedded down—the heart of the bewitching hour. Buster and I heard it together—rapid breathing of a large beast—and sensed movement in the undergrowth coming toward us. I couldn’t find my flashlight and was too scared to take my eyes off the forest edge for an instant. I poked the fire wildly with my left hand, but it refused to blaze. Snorts and cries mixed with crashing undergrowth grew nearer. I was sure Buster and I would give a good account of ourselves if attacked, but by what? I knew we’d do better close to the fire, in the open, and we both stood tensely. Suddenly there was movement—large, dark, with snapping twigs underfoot. It moved into the clearing. Buster erupted into snarls, head lowered for the attack. I gripped my stick, then caught a glimpse well above my head of two stout horns dimly silhouetted against the sky. At the same time, a deep snort. My God, what are we facing? Buster took a half a step and snarling furiously. I yelled, more out of fear than of bravery, and jumped toward it, swinging wildly. It neighed in fear and reared. We’d terrified a horse! It cried piteously and danced around, unsure where to go with me on one side and Buster on the other. I called Buster off as relief flooded through me. In the dark, it took a good while to calm the poor beast and tether it with one of my tent lines. After I tied it off to a sapling, I fed it some granola which it eagerly took from my hand as I laughingly scratched its ears, which had struck such fear masquerading as horns a few minutes before. After the fact, my fire was burning brightly. In the flickering light, our “beast” looked like Whaley’s old swayback horse. No matter who it belonged to, it clearly had broken out of its field and gotten lost in the woods. I gave it some of our water which it greedily slurped, then nuzzled me gratefully. I slipped back into my sleeping bag, laughing at my foolishness, and swearing to rein in my overactive imagination in the future. Buster assumed his usual spot on the other side of the fire, but sat thoughtfully on his haunches. The morning dawned crisp and clear, the light frost adding a bit of snap to a glorious fall day. In the light, I was sure it was Whaley’s old horse and it was pathetically grateful for our company. As I patted him and gave him some more granola, I saw deep scratches on his side. They were fresh and clearly painful. They looked more like wounds from an animal attack than scrapes from underbrush. Unconsciously, I surveyed the perimeter of the clearing, as a chill passed through me. Buster was tolerant of the new member of our group, but was still standoffish and uneasy. I couldn’t feed and water a horse adequately from our provisions, and with its wounds, we clearly had to head back to Whaley’s. Even if it weren’t his horse, he’d know who owned it. I packed our gear and made sure the fire was dead. The old horse was perfectly happy to be led as we started back down the trail. We barely had entered the forest when Buster, who always walked fifteen feet in the lead, suddenly froze, sniffing the air. Then he growled. The horse whinnied and pulled back on the lead, dancing around wide-eyed. I quickly tied him off and joined Buster who was by now sniffing the trail before us, growls unabated. The early morning light clearly highlighted the footprints which overlaid our prints of yesterday. They were unlike any I had ever seen: long, five toed, but with claw marks at the end of each toe. The beast walked on only two legs. Last night’s terror swept back over me, and I shivered despite my jacket. Buster suddenly snarled, looking to some dense brush on the right as we heard other deep growls. The horse bolted and ran, snapping the twig I had tied him to. I could see movement, but no outline in the brush. We were three miles from safety. A roar came from the brush, and I saw a tall, human-like figure pushing our way. I yelled for Buster and took off running down the trail. The mix of Buster’s snarling and alien growls followed me for a hundred yards as I leaped and darted, feet barely touching the ground. At last the sound dropped back and shortly thereafter Buster raced by me, an angry red gash on his right shoulder and another on his right hindquarters. His mug was red with blood, so he gave as well as got. After a while, he paused and turned to face back up the trail. I stopped beside him and tried to still my labored breathing and pounding heart. All was now silent. After another few moments of silence, I checked Buster, whose wounds looked superficial, and we started back down the trail at a fast trot. I didn’t slow down to a walk until we broke into the open at the back of Whaley’s fields. Even then, in the broad daylight, I kept looking back. Buster trotted without pause and was at the truck long before I arrived. I came around the corner of the barn to see Whaley rising from Buster’s side, patting him on the head, a concerned look on his face. He listened unmoving to the whole story. When I’d finished, there was a long silence before he spoke. I watched him stride up the path, gun over his shoulder, till he disappeared at the wood’s edge. It was the last time anybody ever saw him. The Cherokee Wampus Cat maybe ? It’s known to walk on two legs, and has haunted the mountains since before white settlers arived. There are things at the edge of the woods when you hunt. Many things track you as you track your prey. Bears, cougars, wild pigs, even coyotes will sniff you out. Keep you eyes, ears and nose open and you should be ok…..maybe. Loved the story! I’ve always enjoyed tales like this and have been a fan of cryptids, ghosts, and anything that goes bump in the night. This was a great story! Has a lot of suspense that keeps you wanting more! Thanks! My mom was from Kentucky and dad from Pennsylvania. I’ve heard many creepy stories about those areas. I never had a reason to not believe those stories as they were told by aunts and uncles as well. This is just as good as any I’ve heard. Always gives food for thought. You just can’t be sure, can you? Thanks for the nostalgia of it.